Iceland has an impressive number of animals and birds - especially in summer. We didn't try to seek them out in our trip, yet we encountered them on a daily basis. Personally I found them very endearing. It is impossible to have a summer road trip in Iceland and not see the Icelandic sheep. The sheep population is higher than the human population in Iceland. They're literally everywhere, even in the most remote corners we went to. Some of the sheep became our road-blockers as we ventured away from the ring road. The sheep became my comfort zone - in the sense that if I saw an Icelandic sheep, I knew we would be ok (even if we didn't humans). From what I could see they only did one thing - eat grass. Eat, eat and eat some more. Sometimes they were precariously perched high up in the mountains, dangerously balancing themselves on rock ledges - and all that to eat more grass. If you haven't heard of Icelandic horses before, I'd be surprised. Spotting a horse here is as common as spotting a sheep, although you'll probably see 1 horse for every 10 sheep. Icelandic horses are shorter than the regular horses (so they look more like ponies) but that does not impact their strength in any way. In fact, they look much more stronger and sturdier. They're also easier and way more comfortable to ride than regular horses. And I can't talk about Icelandic horses and not mention how gorgeous they look. I'm not sure if it's their long manes or their sturdy appearance - but they do look so much more beautiful than horses elsewhere. Do yourself a favor, and ride a horse in Iceland - I'm sure you'll enjoy the experience. This is our favorite bird! So the puffin looks sort of similar to a penguin - but it is much shorter with a stocky build. It's beak/bill has a distinct shape and a bright orange color during the summer mating season. There are millions of puffins on Iceland's coastal cliffs where they come to mate during summer - so that's where we spotted them. It's hard to not fall in love with them once you see how adorable they are. Their head is constantly moving while on land, and they beat their wings rapidly while in air. When they're landing - you feel that they might end up crashing (due to the rapid beating of wings), but they do land pretty smoothly. They're also good swimmers and excellent at catching fish for themselves and their babies. They're actually so good at catching fish that they're usually attacked by other birds once they're closer to land - so they need to constantly guard their catch. So we actually spotted a seal for the first time at the famous Jökulsárlón. I initially thought it was a dog and was wondering that it might be freezing when my husband pointed out that it was actually a seal. Right there in the midst of these blue floating ice-bergs was this cute little seal bobbing up and down in the water. So so awesome! The next time we spotted one - it was at the remote Strandir coast in Westfjords. This seal was perched on a rock near the shore and sun-bathing. It definitely looked like it was enjoying itself in the warmth of the sun. 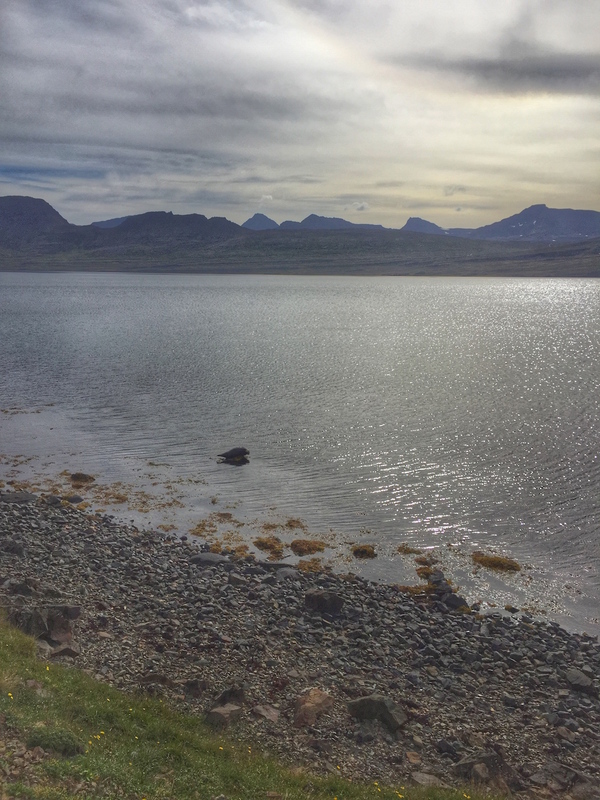 Later that day, we encountered multiple seals in West Iceland between the towns of Stykkishólmur and Grundarfjörður close to sunset time (around 9 PM). These seals were playing in the water close to the shore and they kept moving from one end of the shore to another. There were at-least 3 different seals. It was a joy to watch them goof around and play in the water. If you plan a ring road trip in summer - you're most likely going to see a seal somewhere. If you absolutely must see a seal - there are multiple seal watching tours that you can join. We were incredibly lucky to see a couple of reindeer in Iceland. We were driving through South East Iceland, and planning our stop for the night - when we drove past two reindeer (they were most likely inside a farm along with horses and sheep - but I'm not 100% sure). We immediately noticed them because of their famous antlers - and they were definitely stunning. I wish we could've seen more reindeer, but we never spotted them again. If you're hoping to see them in Iceland - try South East or East Iceland and good luck! There were a lot of other animals and birds we saw in Iceland - including Kittiwake, Arctic Tern and Jellyfish amongst others. I can't think of another place where you can see so much without even trying (maybe Africa?). There are also a ton of whale watching tours all over Iceland's coasts - so if you want to see the biggest mammal on earth - you can take a tour. Most of the tours have 100% success rate because the whales comes to Iceland coasts in the summer for the abundant fish and sea-life. The one animal we didn't get to see at all was the Icelandic Arctic Fox. Hopefully, we get to see it the next time. What were the animals you saw in your Iceland trip? or else-where? Which one did you find the most awesome?